Over the past century, Red Rocks Amphitheatre has become one of the most storied venues not just in the United States, but around the world. Now it’s getting ready to open another chapter as the summer concert season kicks off in April. 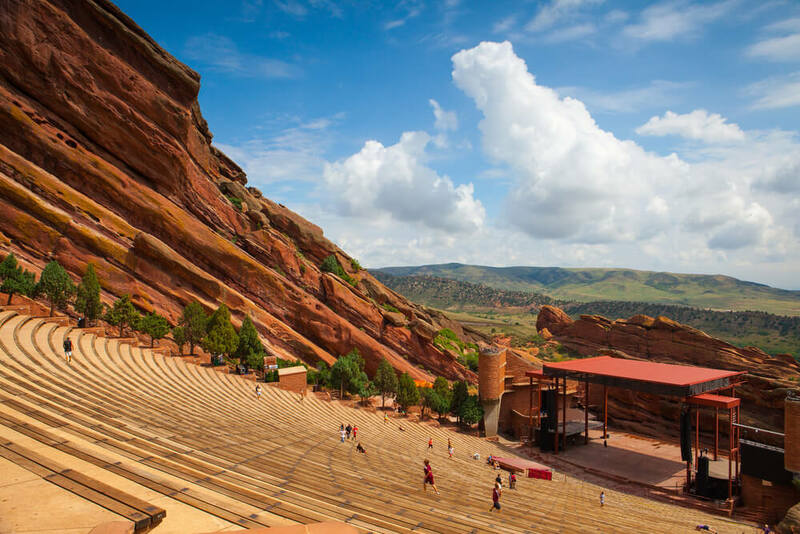 Back at the turn of the last century, John Brisben Walker realized that the 200-million-year-old formation of red rocks southwest of Denver provided the ideal acoustic environment for live performances, and began producing concerts there in addition to offering a thrill ride. In 1911, opera singer Mary Garden became the first nationally-recognized act to perform on a makeshift stage at what was then known as the Garden of the Angels. It was not long before the natural amphitheater was recognized as a Natural Wonder of the World. Later, the City of Denver purchased the property for just over $50,000. With the help of the Civilian Conservation Corps Works Progress Administration created by then-President Franklin Roosevelt, in 1936 the city began constructing a formal amphitheater in the rocks, along with other buildings. Red Rocks Amphitheatre was officially dedicated on June 15, 1941. Into the ‘50s, orchestras and opera companies typically performedat Red Rocks. But soon solo artists began appearing more frequently. The earliest rock performance at Red Rocks? The Beatles in 1964. It was the only venue on the band’s first U.S. tour that did not sell out. Many legendary acts followed. But during a Jethro Tull performance in 1971, an incident between concertgoers and police resulted in a five-year ban on any rock acts performing at Red Rocks. That ban was lifted well before U2’s renowned show at Red Rocks in 1983. The performance was filmed, and later released as the band’s concert film U2 Live at Red Rocks: Under a Blood Red Sky. Other acts that have produced CD and DVD material at Red Rocks include the Dave Matthews Band, The Samples, The Moody Blues, Incubus, Blues Traveler, Widespread Panic, Boukman Eksperyans and Neil Young. B.o.B., the Zac Brown Band and Train have all filmed music videos at the venue. Red Rocks’ influence on pop culture extends well beyond music, too. The venue has been featured on episodes of The Simpsons, Dr. Quinn, Medicine Woman, The Amazing Race and South Park. And with only a few exceptions for weather, Red Rocks has hosted a sunrise service every Easter since 1947. For Colorado-based acts, performing at Red Rocks has become a rite of passage. John Denver; Earth, Wind & Fire; The Lumineers; OneRepublic; 3OH!3 and Judy Collins have all done shows there. Over the past decade, the number of shows booked at Red Rocks has tripled, to over 2019 slated for 2019. The season opens on April 13 with Flabbush Zombies/Joey Bada$$; go to redrocksonline.com for the complete schedule.